Dancing Partners presents a rare opportunity to enjoy the work of four companies at the front of contemporary dance from all over the world. Join us for an exciting evening of performance, featuring four beautifully crafted and individual pieces. 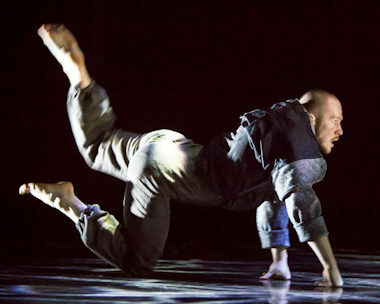 Manchester’s Company Chameleon are joined by Spellbound Contemporary Ballet (Italy), Norrdans (Sweden) and Thomas Noone Dance (Spain) for an international dance showcase. Mesmerising contemporary ballet performed by Italy's finest. Prepare to be entranced, Mauro Astolfi's choreography is hypnotic. Four male dancers create a mirror of each other to create a drama that tells a story exploring everyday emotions. A tightrope of togetherness, will you catch me if I fall? Let go, hold tight, what does it take for a bond to be broken? Powerful and emotive, this contact-based duet explores the tensions of union and how we display strength and vulnerability in relationships. Mother, father, daughter and a sort of outside being take you into a fantasy world in this dramatic and expressive thriller. Let your mind go on a journey of inner fears, wishes and dreams, but how much is in your head and how much is for real? Watch Me turns the spotlight back to the audience and challenges our perceptions as spectators. The piece explores how we interpret what we are watching and how we are programmed to respond according to context. With such a hub of dance knowledge and expertise in one place, the choreographers and dancers take the opportunity to learn and develop from each other. This Open Rehearsal presents the chance to see some of the developmental process. This is an opportunity to go behind the scenes, see the dancers prepare and get up close to the rehearsal process.